Restaurant chain Pizza Hut has introduced a smoking ban in all its UK restaurants. 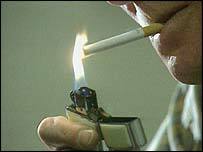 The company said it hoped the move would protect customers and staff from the dangers of passive smoking. The ban, which came into effect on Monday, covers all 500 branches, although outlets recently opened were already smoke-free. The company says it is the UK's first nationwide restaurant chain to introduce the measure. Smoking will still be allowed at its delivery and takeaway-only outlets. Deborah Arnott, director of ASH (Action on Smoking and Health), said: "This will be good news for customers and good news for business. "Second-hand smoke is a serious health hazard for staff in the restaurant trade and research shows that over half of all adults want to eat in smoke-free restaurants." Brian Rimmer, operations director for Pizza Hut, said: "Pizza Hut strongly believes that families should be able to take time to have a leisurely meal in a restaurant without exposing their children to other people's smoke. "It is equally important that our staff can work in a smoke-free environment." Last week, health officials in Brighton urged the city's cafes and restaurants to ban smoking on their premises. The Brighton and Hove Primary Care Trust hopes to persuade Brighton and Hove City Council to introduce a ban. "Many other restaurants chains are considering a similar ban"